Santi's Story . . .
Santi’s neutering surgery went well and he healed nicely. While he recovered, his foster mom did her best to keep the EverReady Bunny quiet by keeping him crated and providing leash walks. 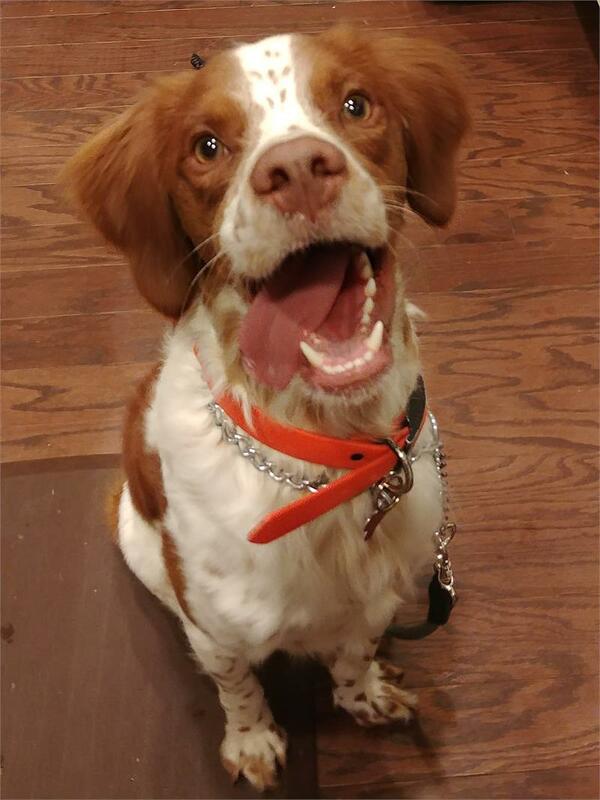 The resident Springers really wanted their fun playmate back! Basic commands have been worked on with Santi. He is eager to learn and is a quick study. This smart, sweet, and energetic boy will be ready soon for his forever home. 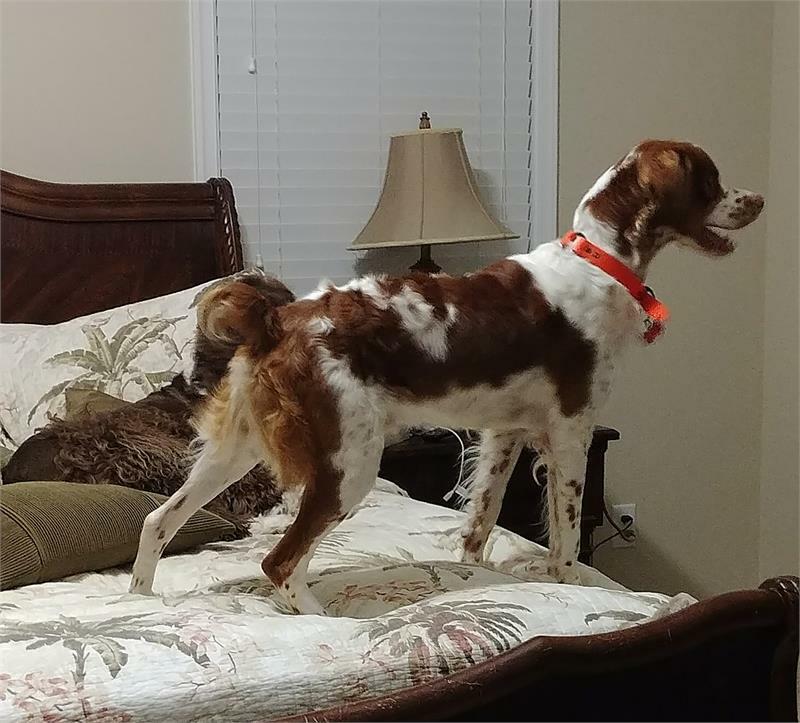 This sweet one year old Brittany was relinquished when his busy South Carolina family realized that they didn’t have time for a high energy pup that needed a lot of exercise. Santi’s family worked and had two active children. No fenced yard and a working family meant Santi spent a lot of time in his crate. Santi is a smart, high energy and loving young boy. 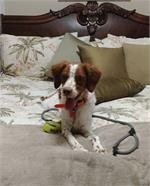 He loves the fenced yard in his foster home and the two resident Springer playmates. He zooms around the yard like a gazelle--now you see him, now you don’t. His foster mom calls him the ever-ready bunny. Santi does well in the fenced yard but would not be trusted off leash. He loves to play with toys and other dogs. He is a sock and shoe thief if closets are left open or shoes and socks are left on the floor. He will chew toys but is easily diverted with a simple “attttt.” The foster mom gives him full rein of the house with the two residents, something she believes is new to him. He will jump on the bed and the sofa. He does counter-surf, but, again, is easily diverted. Santi has not exhibited any type of resource guarding and things can be easily removed from his mouth. Santi is crated at night and when the foster mom is not home. He goes in the crate without a problem but protests a little with barking before settling in. His foster mom is working on recalls, “sit and wait” before coming inside, “sit and wait” for food with the command “ok to eat,” “off,” and “drop it.” He would benefit from training classes. In fact, MAESSR only places puppies in homes that are committed to training and bonding with the pup in obedience classes. Puppies require a lot of care, attention, and patience, and they do chew on things! The decision to get a puppy and raise it to be a healthy, happy, and well-adjusted dog is a serious commitment. To reinforce this commitment, MAESSR requires all adopters of dogs one year old and younger to enroll their puppy in obedience classes within 60 days of adoption. The new guy in the house loves attention but is on the go kind of boy. 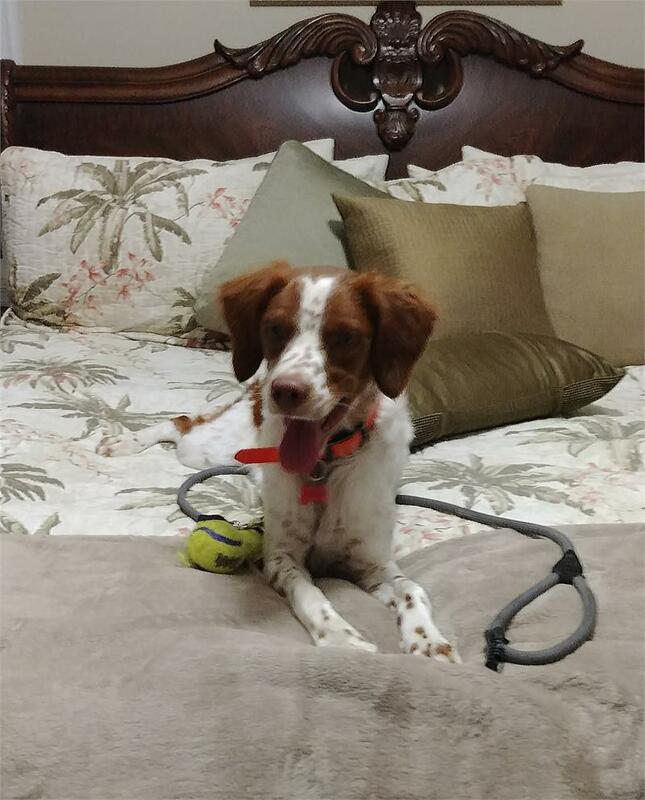 He likes to run and play fetch and loves good game of chase with the resident Springers. And, clever lad that he is, Santi has found that if he stands on the bed he can “talk” to the dog in the mirror!! Santi is an awesome dog for a high energy family with a fenced yard and the time to stay on the move with him and give him as much well deserved attention as possible. He would probably enjoy a doggie friend also. He may not be a Springer, but he’s a wonderful love who will enliven any home, and, after all, you know, Springer is only a state of mind.